Latest week we did a collection post on some of the best Coupon WordPress Themes of 2019. Many of our readers asked us about more detailed features of those themes. Coupon from MyThemeShop is a premium WordPress theme for building coupon and deals websites. Boasting a professional and attractive layout with a modern, minimalistic touch, the theme is sure to catch eyes and improve user engagement. However, not all its features are catered towards the looks department as you will find plenty other niche-specific functionalities. Before we start talking about how to use the theme to develop a professional coupons & deals portal, let’s check all its different features and functionalities. The primary purpose of installing a theme on your WordPress website is to change the overall aesthetic and ambience. Coupon WordPress theme brings forth a professional looking design layout which perfectly fits into the deals and coupons niche. To start building your website, you will get access to 5 different ready-to-use demo websites. 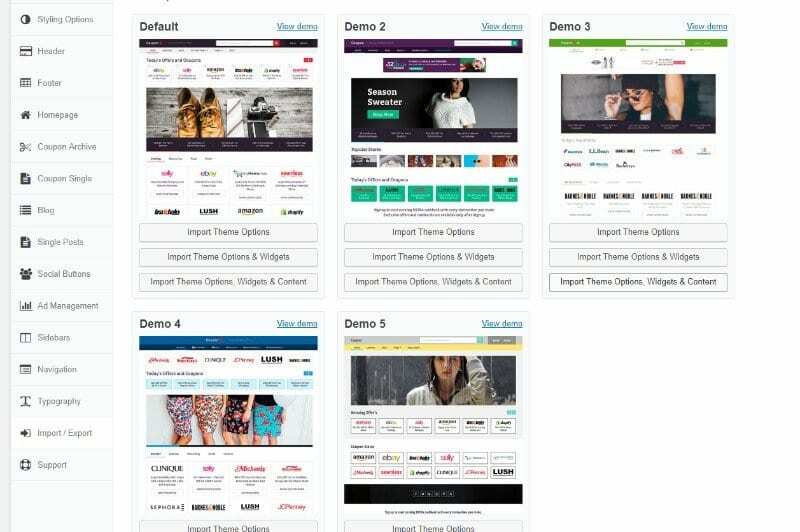 You will also get access to a dedicated demo importer which can help you import the theme options, widgets, and even demo content with just a single click. Many times, themes come with a generic looking homepage which isn’t great when you are running a niche website. Here you will get a unique homepage which broadcasts as many deals and coupons as possible, in a clean, easily interpretable layout. Users will love to get access to many deals from their favourite stores gathered in a single display. You will get access to a categories tab directly on the home page. Then, there is the Store Section where you can display all the different e-store whose coupons you carry. This allows you to organise your content easily and helps your visitors to find relevant deals quickly. Everybody has a mobile phone these days. It is highly likely that they will enter your site through their mobile devices. As such, it makes sense to create a mobile-friendly website which resizes for small screen viewing. Luckily, this theme is fully responsive and will adjust the layout such that mobile users can conveniently browse all the coupons and deals on your site. The theme also comes with a decent collection of customisation options. You are not stuck with the default designs that you get with the pre-made demos. Instead, you can use them as a template and start making tweaks to flush out your brand. 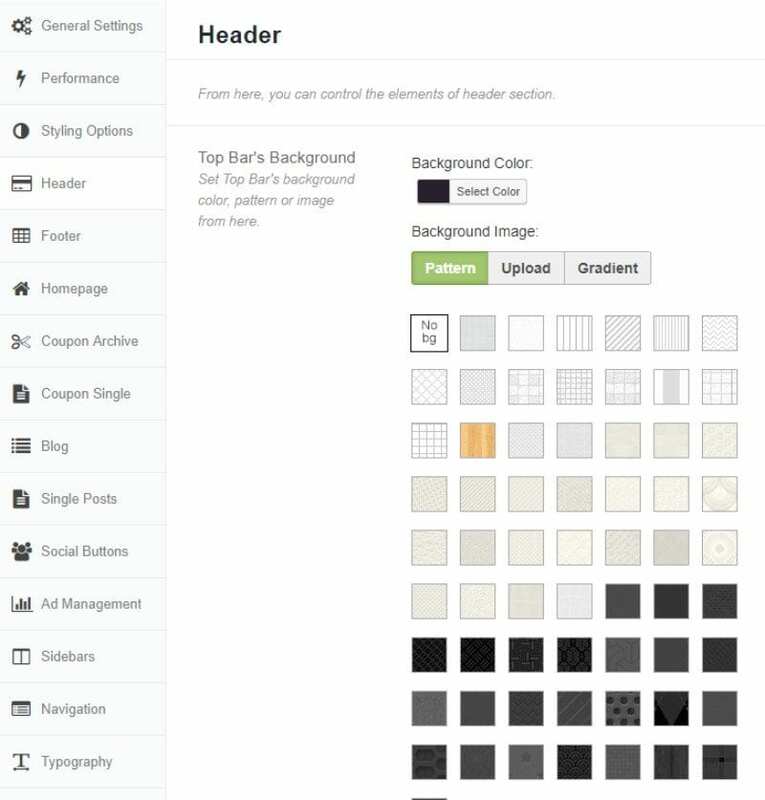 You will get access to a powerful options panel from where you can tweak around with the colour scheme, adjust the different header and footer settings to your likings, set your company logo, and lots more. Mostly all aspects and design elements of the theme can be tweaked to your unique taste and preference. You have the option to set up a customizable carousel on your site’s homepage to Highlight all your best and featured offers. There is also the inclusion of a custom slider. This can be another handy tool to showcase attractive offers and deals. Also, if you have a blog on your site, you can use this to attract more users to some of your articles. The Coupon Archive serves as a repository for all your coupons. Your visitors can come in and browse through all your coupons with ease. There is also a powerful search functionality which helps users find relevant deals. You get support for different types of promotional deals. This includes options like flat discounts, 2 for 1 deal, and so on. You can use these feature to group similar types of coupons together for better organization. Not all coupons will be usable forever. And so if you put an expiry date besides a coupon, then it can save your users from wasting their time on invalid offers. There is a dedicated option which allows you to provide incentives to your users for using coupons and deals on your website. This can help you increase your site’s conversion rate and create a loyal user base. You can enable an ajax-powered use counter on each coupon. This will allow your users to see how many times a coupon has been used. Popups are marketers’ best friend regarding gaining exposure with your users. You can use popups to showcase featured coupons and deals to your users which can be an effective technique to improve conversion rates. With a recent offers section, you will be able to show your users the great offers and deals you previously had on your website which expired. This can be an awesome way to hook users’ interest and gain recurring traffic or subscribers. Based on the coupons and deals a customer is using, you can display a related offers section to show coupons and deals they might be interested in. Another awesome technique to boost conversion rates. Coupon WordPress theme is coded with the best SEO practices to help you attain a higher rank on the search engine ladder. It is designed to handle both on-page and off-page SEO to help reel in more organic traffic to your site. WooCommerce plugin helps to enable e-Commerce functionalities inside a WordPress website. Since you are running a deals and coupons website, it makes sense that you have the extra option to sell products and services directly from a storefront natively on your site. This can be anything like paid coupons, event tickets, premium membership to your site, and so on. RTL (right to left) language support. How to Use Coupon WordPress Theme? By now you should have a clear idea of what you can do with the theme. And so the next question that should come to your mind is how to use all these features. To help you out, we have prepared an in-depth tutorial regarding all the different options and settings on your WordPress backend. 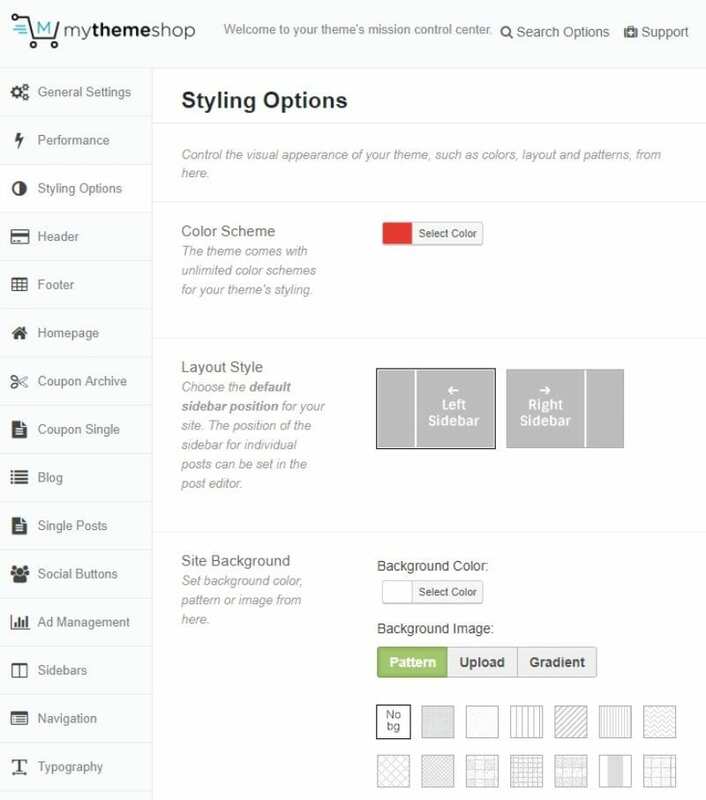 Once you have installed the theme on your WordPress website, a new Theme Options panel from MyThemeShop should appear in your WordPress dashboard. To access it you need to go to Appearance -> Theme Options. 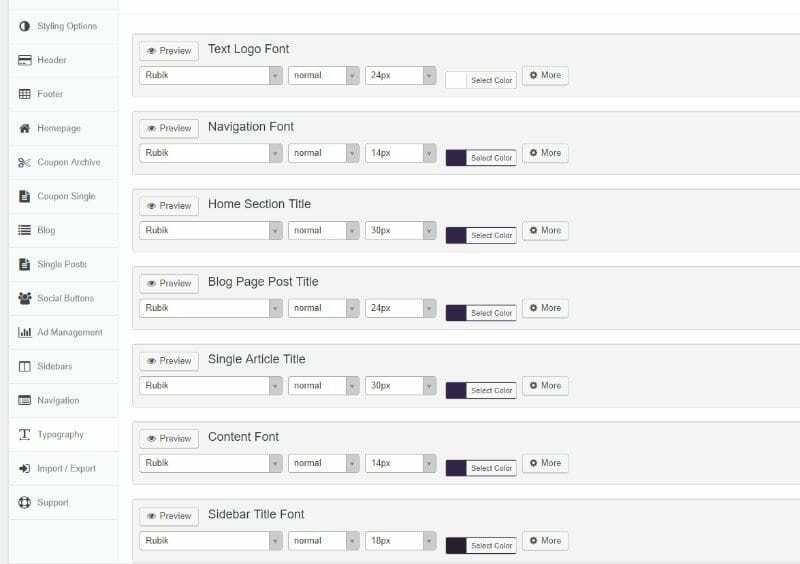 From here you will get access to a plethora of options to help you get control over almost every aspect of your WordPress website. All the options are also conveniently categorised under further sub-sections to help you with your customisation efforts. 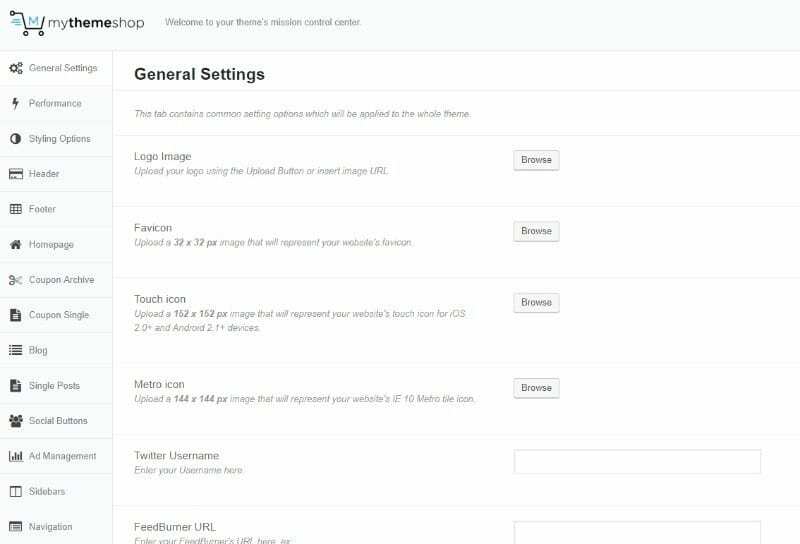 From the General Settings tab, you will get the option to upload a logo image, favicon, Touch icon, and Metro icon for your website. It is also here where you will be able to set your Twitter Username if you want it to appear on your site. Other than this, if you want to enable some scripts on your site, you can do so using the Header Code and Footer Code area located here. And finally, you have access to some pill buttons to trigger on or off Ajax Quick Search, Responsiveness, RTL support, and No. of Products you want to display on your Shop Page (WooCommerce needs to be enabled for this). 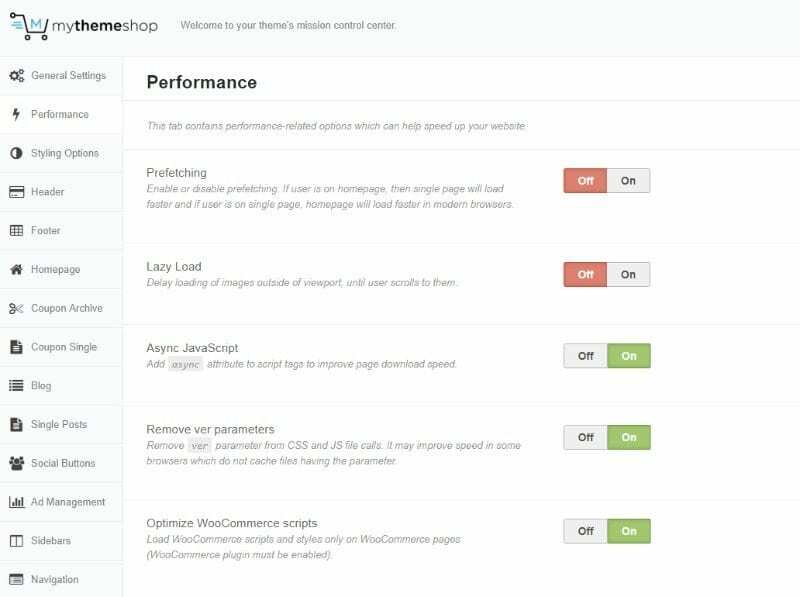 These settings help optimise your site’s loading speed and performance. Under the Styling Options, you get access to all the essential customization options. This includes the option to select your site’s Color Scheme. Then comes the option to choose between two different Layout Styles. You can also set the background color or background image from here. And lastly, if you want to implement your own custom code, you can do so from the Custom CSS field. Under the header section, you will get access to a boatload of options which gives you complete control over every aspect of your website header. First, you will get to choose a color or image for the top bar, followed by the option to enable/disable Parallax Scrolling. Next comes the option to enable/disable Header Search Form, enter a Header Search Place Holder, and also enable/disable login & registration button on the top bar. 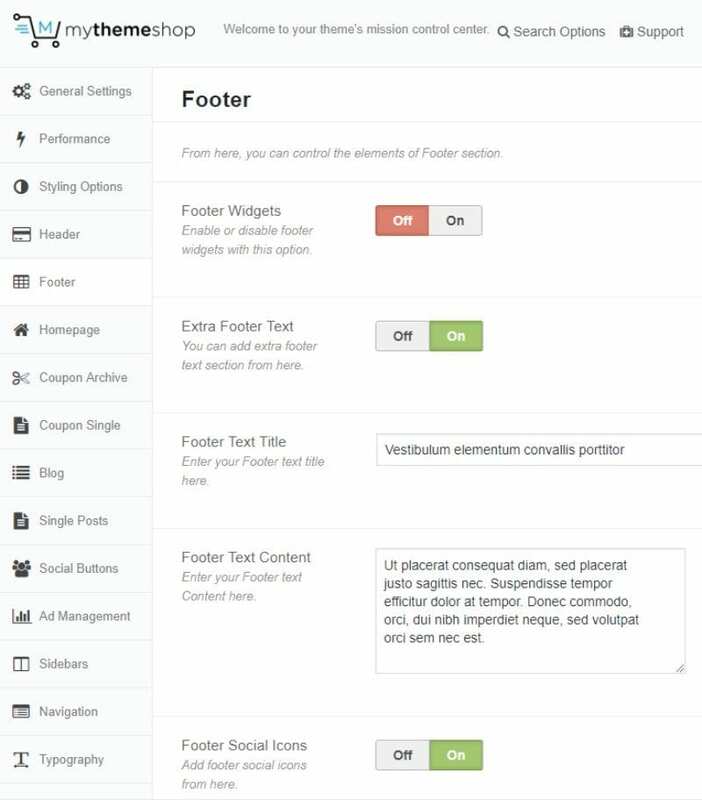 The Footer section is similar to the header section in the sense that it collects all necessary features that let you gain complete control of your site’s footer area. First, you get the option to enable/disable Footer widgets. Then you can set extra Footer Text along with a dedicated text title and content. You can even add social icons to the footer if you like. After this, you get access to set the Copyright’s background colour/image along with the Copyright text for your website. The homepage section is further categorized into multiple subsections for easier access to all the options. You will get dedicated sections to control the homepage layout, slider, carousel, category tabs, social icons, popular stores, subscribe button, and sign up area. Each of these subsections is further populated with an arsenal of settings and options to help you control all these areas. 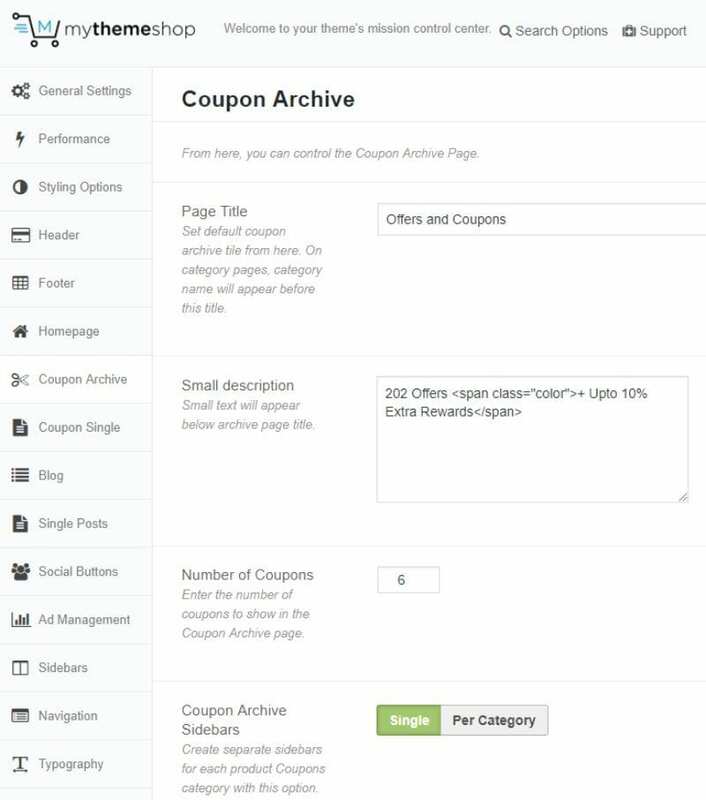 Here you get all the necessary options to control your Coupon Archive page. First, you get to pick a Name/Page-Title followed by a small description about the page – this will appear to your users. Next up, you can set the number of coupons you want to show on your coupons page. You can even use a separate sidebar to distinguish between the coupons. There is also the option to show/hide expired coupons to your users. Lastly, there are the options which allow you to control how you want the post meta information to show on your Coupon Archive. There are even four different pagination types for the Coupon Archive page. 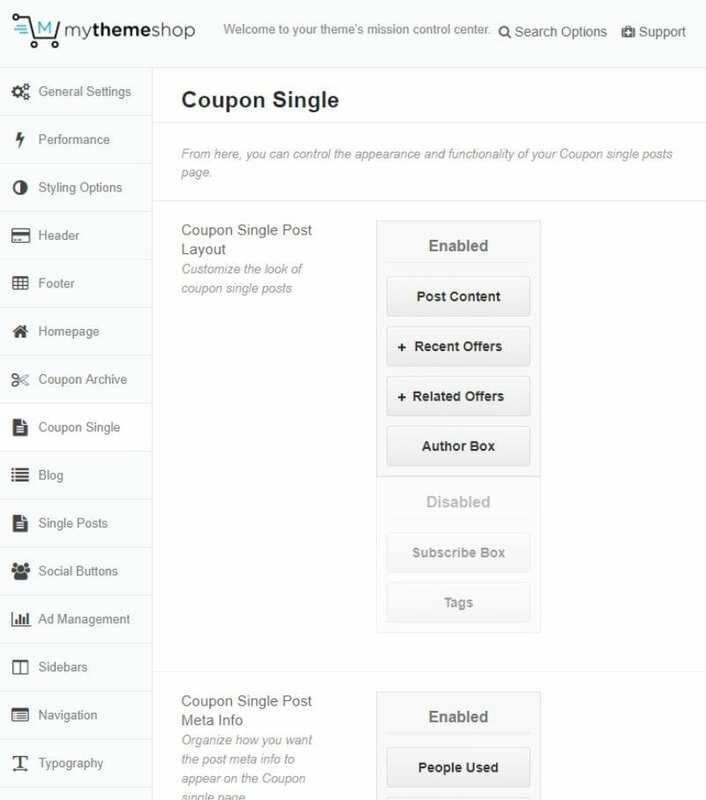 The Coupon Single section comes with all relevant options to help you control the appearance and functionality of your Coupon single posts page. 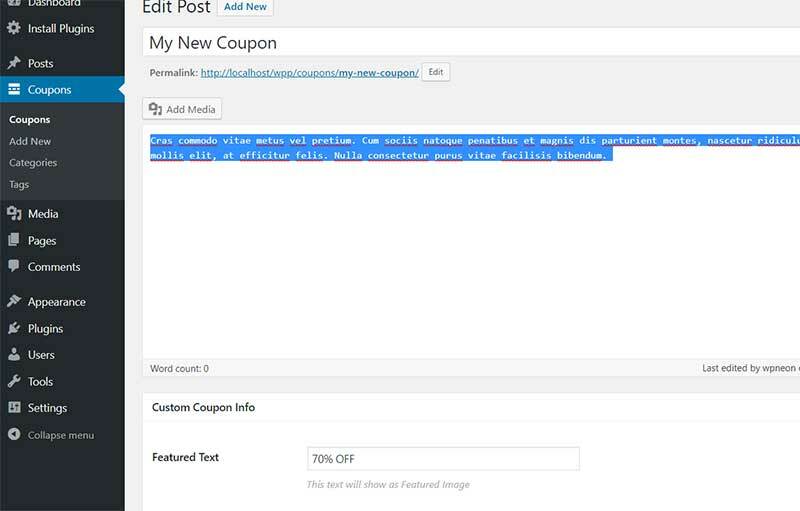 You will get the option to customize the look of your Coupon Single Post layout by enabling/disabling, Post Content, Recent Offers, Related Offers, Author Box, Subscribe Box, and Tags. It is also from here that you can organize the way you want the post meta information to be displayed to your users. You can configure the Subscribe Box to appear as a popup on your site. You can also set the “show coupon” option to show as a pop-up or pop-under. 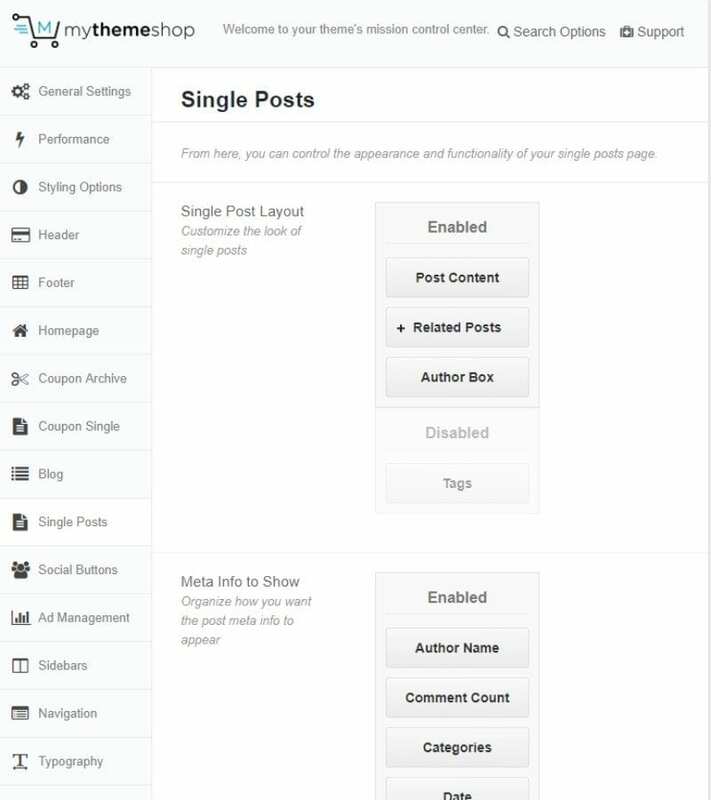 From the Blog section, you can set how your Blog Page will appear to users. You can set Featured Categories which will enable certain categories from appearing on your blog. Then you have four different pagination styles for easy browsing. Next comes the option to show excerpts of a blog post or the full post on your blog. 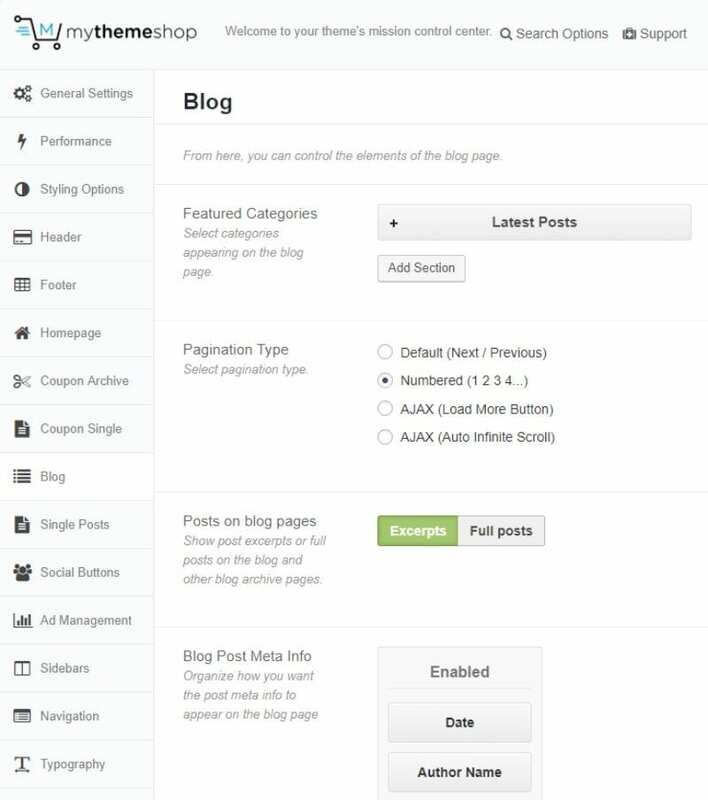 You also have the option to control which Blog Post Meta info you will show to your users including date formatting styles. It is also from here that you get to enable/disable lightbox. From the Single Posts Section, you can set the layout, meta information, enable/disable breadcrumbs, highlight author comments, and even enable show date in comments. The theme comes with social media buttons for all the popular social networks including Facebook Share, Facebook Like, Twitter, Google Plus, Pinterest, LinkedIn, and StumbleUpon. You can choose to enable or disable any one of these buttons. There are also options which allow you to choose whether or not you want to show the social share buttons on different web pages. You can even change the position of your social sharing buttons to “Above Content“, “Below Content“, and “Floating“. 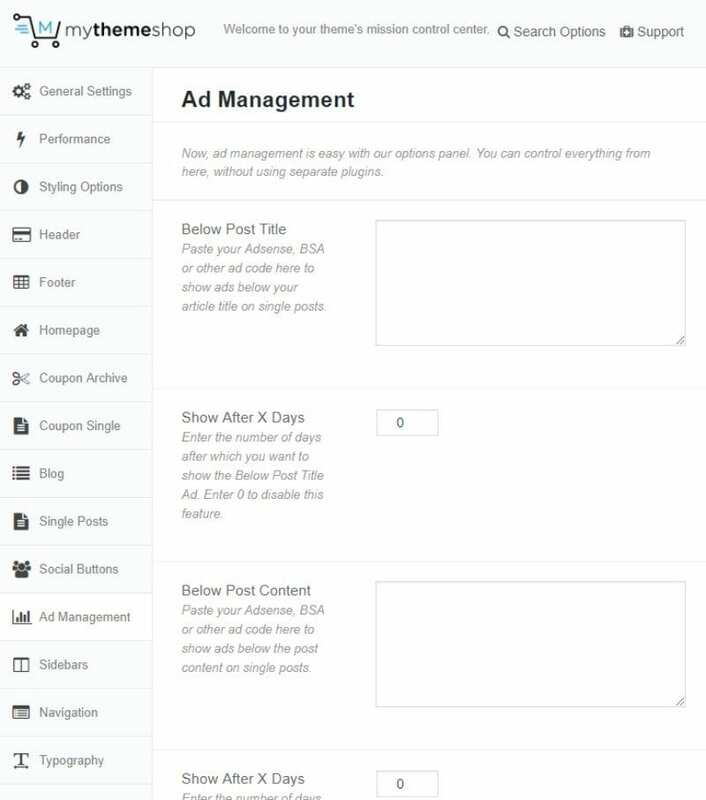 From the ad management area, you can control how to integrate and show ads on your website. You can paste your AdSense or other ad code in the provided area to show ads below post titles or below post content. You can even specify a particular number of days after which you want to show the ads. 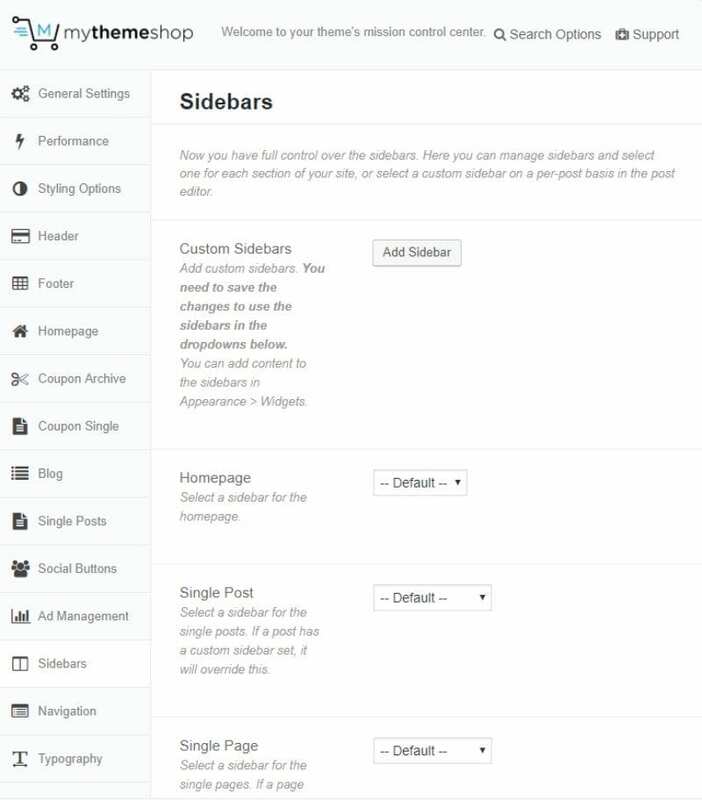 Under the Sidebars section, you will find all the relevant settings and options to help you take control of your site’s – sidebars. 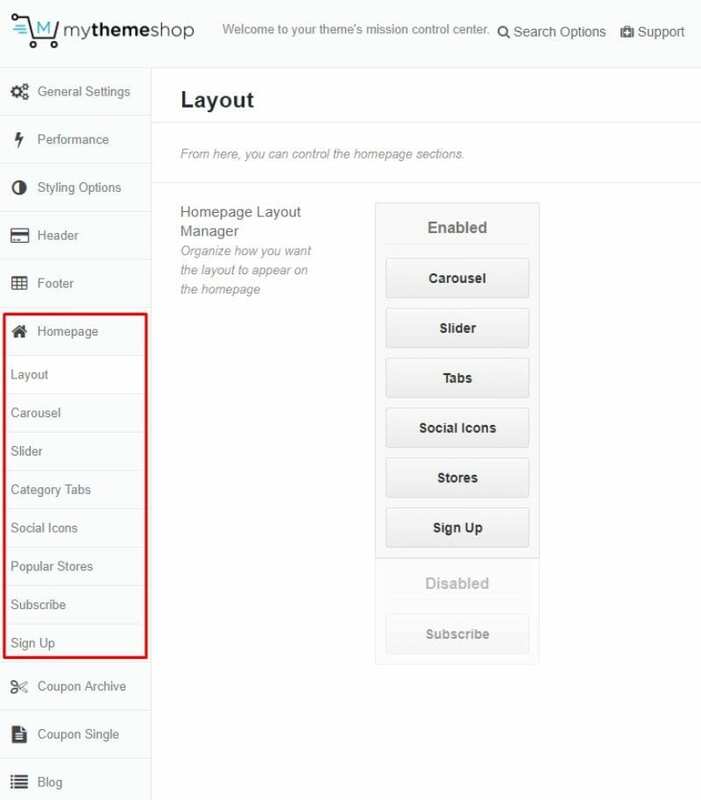 You can enable/disable custom sidebars, show sidebars on your homepage, posts, pages, coupon pages, coupon archives, and so on. 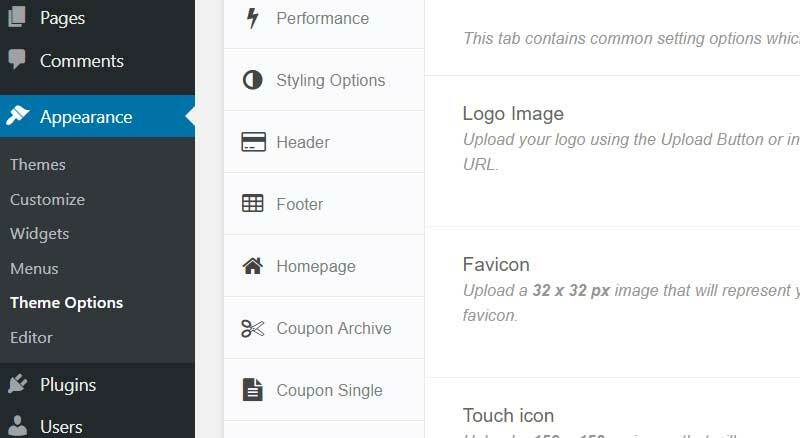 The Navigation bar leads you to the menu options of your WordPress dashboard. You will get the options to change how your users browse through your website. From the Typography section, as you can imagine, you will get options to tweak around with the different font style and font sizes of different parts of your website including the text logo, titles, different headers, and so on. From the Import/Export section, you will have the option to import the five different premade demos, export your existing theme options, and even create/enable child theme. 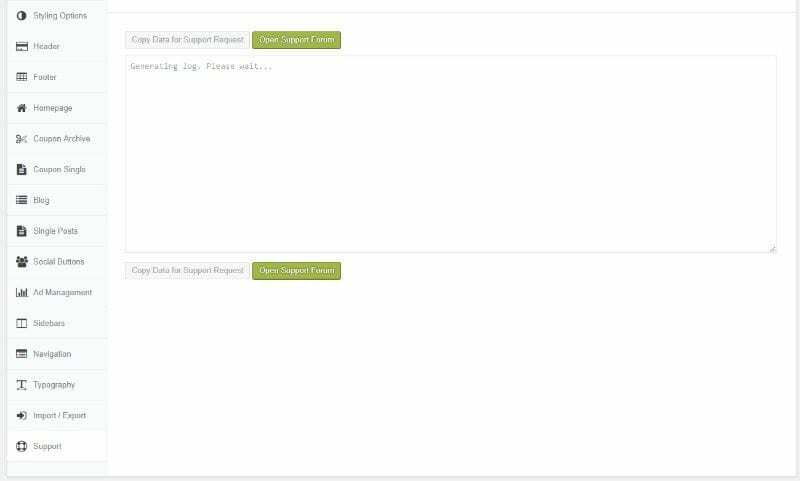 From the support page, you will get the option to “Copy Data for Support Request.” You can show your support expert this information and they will be able to diagnose your issue better and come to a resolution. How to Add New Coupons? Since this is a Coupons and Deals theme, you will find a dedicated section that will help you create Coupons for your WordPress website. 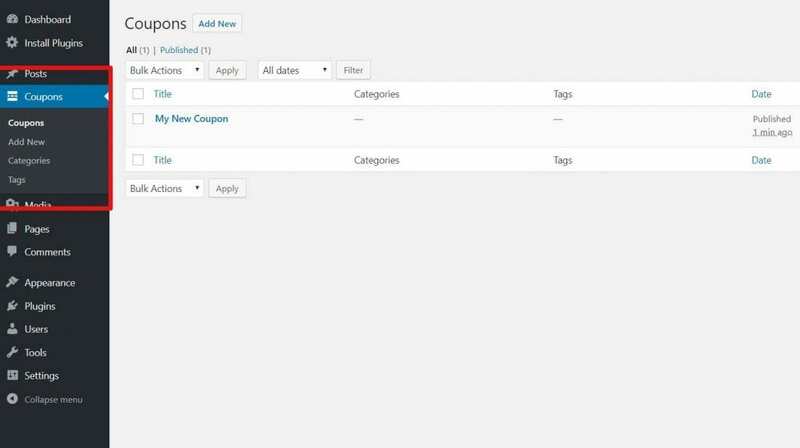 Once installed, a new option dubbed Coupons will appear in your WordPress dashboard. From here you will get options to “Add New” coupons as well as set “Categories” and “Tags” for your coupons. The interface is similar to what you get with creating new posts. Sometimes you can even find the theme listed under a discounted price of $35.00. At this point, it is essentially a steal. And of course, if you are dissatisfied with the experience, you can always ask for a refund courtesy of their 30-day money back policy. Should You Buy Coupon WordPress Theme? 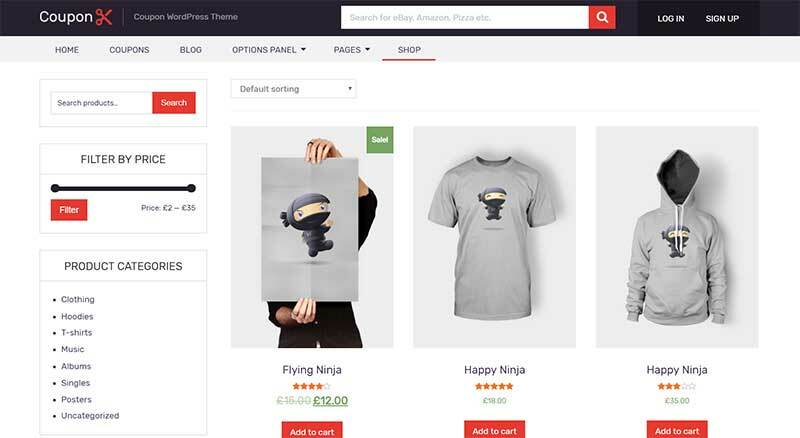 As you can see, the Coupon WordPress Theme from MyThemeShop comes riddled with a lot of useful features and functionalities that you will find helpful while running your coupons & deals website. Plenty of its niche-specific features eliminates the need to install any additional plugins. And regarding design also, the theme hits the nail on the head. All these positives make Coupon an excellent theme to use in next coupons and deals website project. 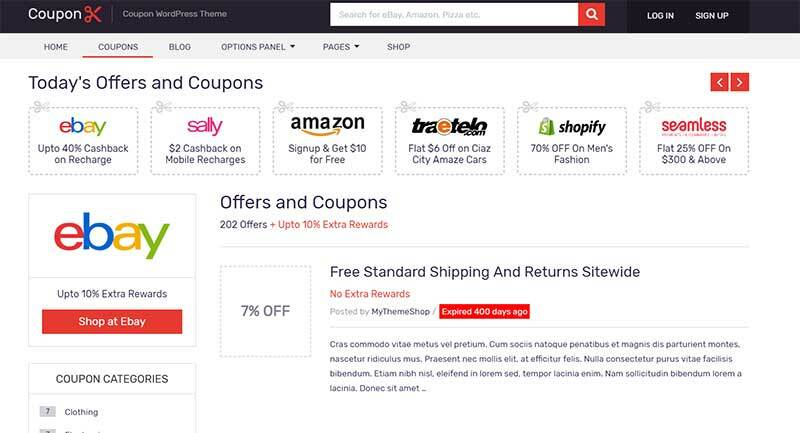 However, if you are looking to expolore some other themes, here is our collection of best Coupon Themes.